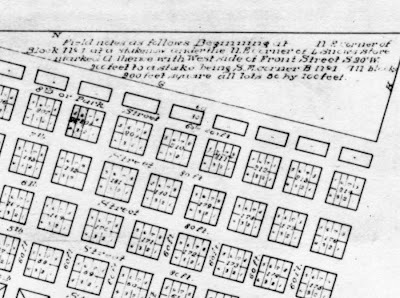 A focused companion in the same vintage as the 1852 Survey Map (which includes the entire city area) comes from the early Portland 1852 Downtown Survey, a more detailed account encompassing the downtown area adjacent to the Willamette River (oriented with north to the right). 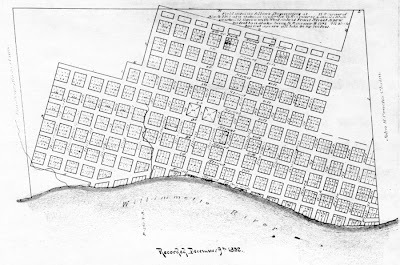 One interesting pattern is the street grid running right into the waterfront – as the river was the hub of commerce and building hung right over the water. As the city evolved this interface with the river lefts some interesting patterns which became a highway, and eventually the current Waterfront Park. A couple of early creek corridors are shown on the south portion of downtown, originating at SW Jefferson Street and winding down SW Columbia to 3rd. There’s another stream originating from Mill Street and continuing southward. I've been mesmerized for years with the idea of these 'disappeared streams' that were later buried under the developed downtown grid. And the form that continues through of the park blocks, in this form continuing from SW Clay to SW Stark. 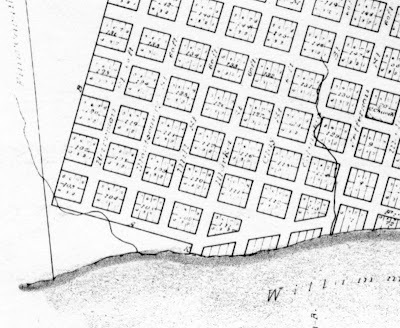 This is a pattern of park blocks that continues north and south as shown in the 1866 Map (look for this in an upcoming post). I’m curious where in the development pattern the North and South Park blocks were severed. Reading List: Kerb 17: Is LA Dead?